Smiths Interconnect’s highly-reliable and ESA-approved KMC and MHD series PCB connectors using Hypertac Hyperboloid contact technology can now be sourced in Europe through TTI, Inc., a world leading specialist distributor of electronic components. 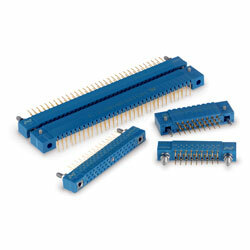 The high density KMC series device features three rows mixing signal, power, and coaxial contacts. The MHD series product is equipped with signal and HE 807 cavities for power and coaxial contacts, offers from 52 up to 400 contact positions and is available in two housing versions: ruggedized metal shell and plastic shell. Both connector series benefit from low contact resistance and a long contact life of more than 5.000 mating cycles. Highly resistant to shock, vibrations and fretting, the components are ideally suited for the severe environments of commercial aviation, defence, as well as space applications. MHD series connectors meet ESA-ESCC 3401/065 specifications and KMC series products are qualified according to ESCC 3401/039.